Our name “Gutter Solutions” says it all. We are focused on providing products and services that give your home the ultimate in rainwater protection. In terms of effectiveness, durability, quality and beauty, our products are top of the line. 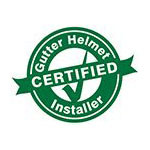 We insist on only the best, and that is why we offer Gutter Helmet to complete your rain gutter system. The patented technology prevents leaves and other debris from entering the trough and clogging the system. Blockage in a gutter will cause water to spill over the sides and cause many moisture related problems from the roof, down through the walls, to the foundation of your home. Gutter Helmet panels eliminate gutter cleaning and keep the rainwater flowing freely to the downspout and AWAY from your home, where it will not cause any damage. After years of working in the construction industry, Gutter Solutions began to notice some common problems associated with seamless gutters. Namely, they expand and contract with temperature change (weakening the attachment system) and they easily get full of leaves and debris. We have found solutions to these problems and give them a Lifetime Guarantee! Our SnapLock® gutter system combined with Gutter Helmet® and our other rain management products will give your home the protection and beauty you demand. Being a company of exceptional customer service, over half of our customers are repeat and referral-based. Find out why we have so many satisfied customers and contact us today! Call (800) 824-3772 or fill out the form here on our page and we will get back to you soon.